You need your immune system working at its best all the time. 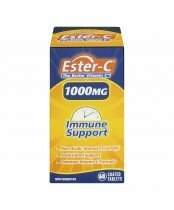 That's why there's Ester-C, The Better Vitamin C. Ester-C is a unique, exclusive form of Vitamin C designed to stay in your white blood cells for 24-hours, providing you with around-the-clock immune system support. After all, you don't want your immune system unsupported when you need it most.